Nanoleaf Aurora is a smart lighting product unlike anything you’ve seen before. 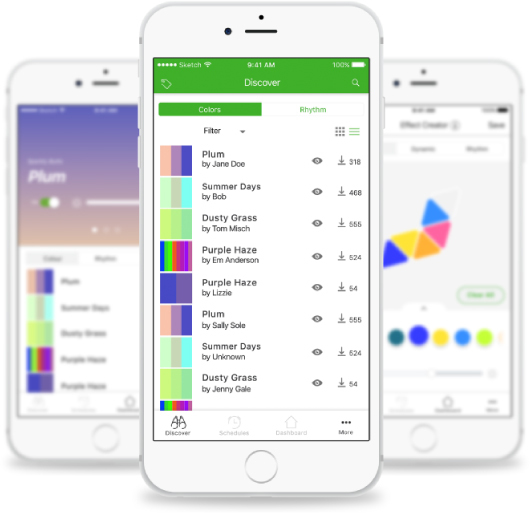 Wake up to the sunrise, improve your mood with stunning colors, and automate your lighting throughout the day. The Rhythm add-on module transforms music into light for your Aurora. Plug it in, turn it on, and embark on a sensory adventure personalized just for you. Piece the triangular panels together into whatever shape your heart desires. Easily mounted onto any flat surfaceusing mounting tape. There’s an entire community of creators and music enthusiasts dreaming up new Scenes. Be one of them and share your Aurora and Rhythm Scenes, or preview anddownload Scenes shared by others. 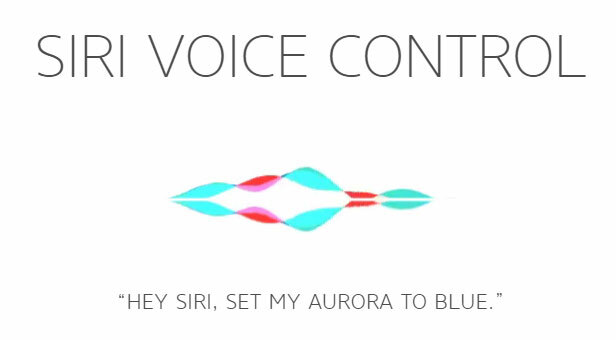 Voice Control avalible with Siri & Amazon Alexa compatibltiy. Changing the scenes is as simple as telling your smart device what to do and watching the scene change before your very eyes within seconds. Installation is made simple with the included mounting strips, stencils and panel connectors. As all mounting has been designed to be drill-free, attaching the Aurora Smarter Kit with the included mounting strips ensures damage to your wall is minimised and means creating new designs or re-locating Aurora is problem free. The Aurora Rhythm is an add-on module for your Nanoleaf Aurora that upgrades your Aurora light panels into a real-time music visualizer. The Rhythm makes it possible to see sound, visually remastering your music into animated displays of colour and light. With gorgeous colour displays produced by your own soundtrack, the Aurora Rhythm creates an immersive symphony of light and music that’s personalised just for you. Works with iOS8 or later (HomeKit), Android 5.01 or later, Apple Home App, Amazon Alexa, and IFTTT. The upgrade module requires a Nanoleaf Aurora Smarter Kit to function. Note that the Rhythm Smarter Kit on this page includes the upgrade module, no need to buy separately unless you want a second Rhythm unit. Drill-free mounting kit included—no holes, no hassle! Add Auroras and smart lights to room groups to control multiple lights and personalize your home even more! 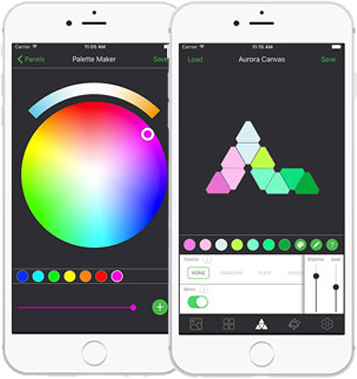 Create and save time triggers to turn lighting scenes on and off automatically. Works even better with a Nanoleaf Smarter Cloud account!